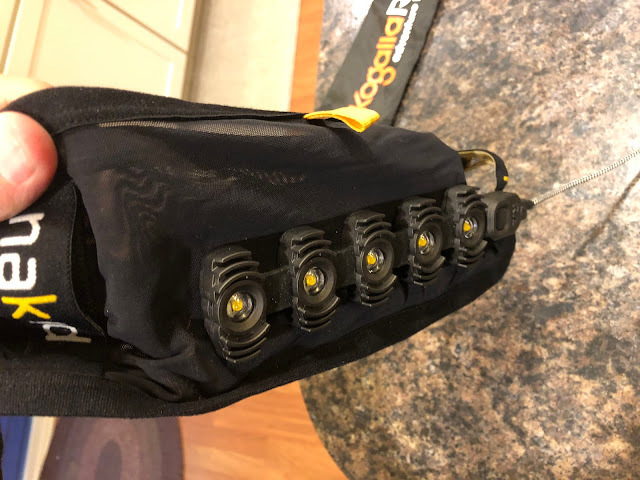 Road Trail Run: Kogalla RA Adventure Light Review - Portable Daylight To Revolutionize Your Night Running and Other Nocturnal Adventures! Kogalla RA Adventure Light Review - Portable Daylight To Revolutionize Your Night Running and Other Nocturnal Adventures! 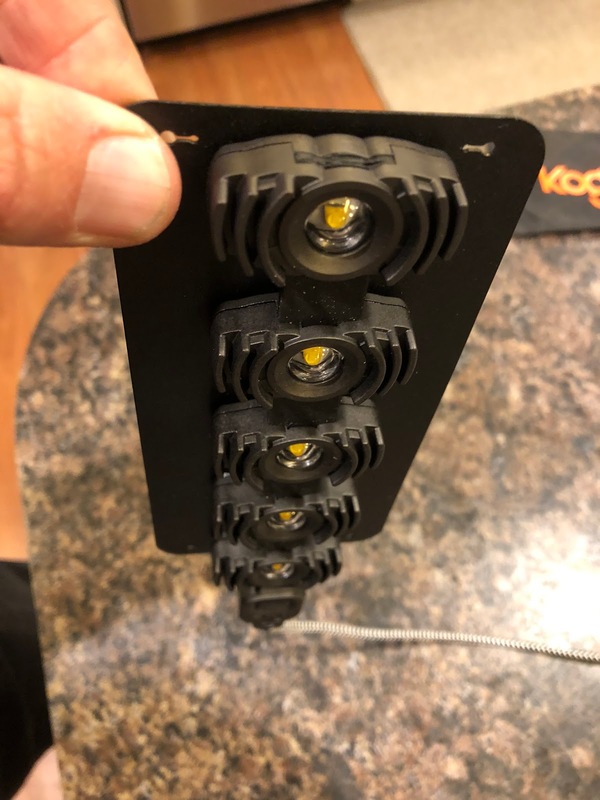 The Kogalla lighting systems are unique in their design, with 5 LED's interconnected to a "light strip", providing up to 800 lumens and a near infinite amount of mounting options for just about any night outdoor sport or activity. 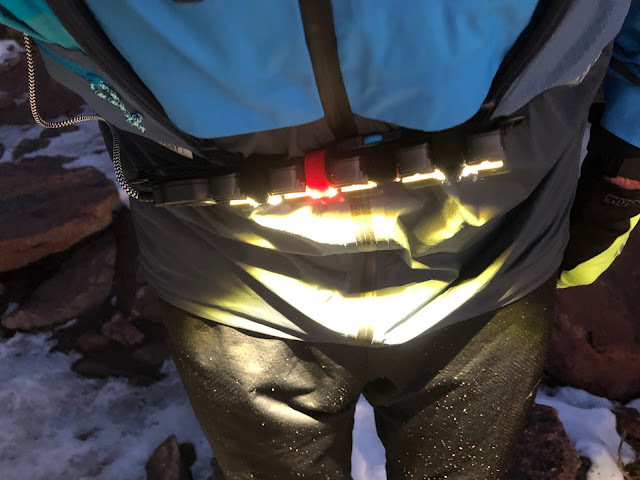 The Kogalla RA provides a large and deep swath of warm light that gives a so far unparalelled sense of definition and balance, even while running on the most technical trails on the darkest nights. 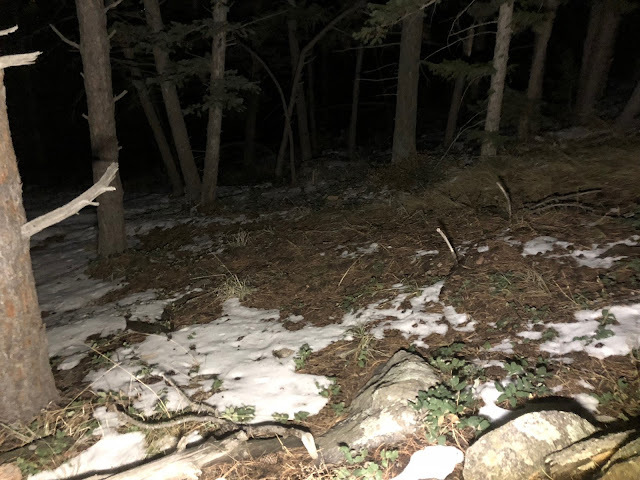 Jeff: With most lights I have used in the past, no matter how many lumens, multiple lights, on the waist, on the head, yes I can see the trail and can see far ahead with a high powered focused spot beam, but something has been lacking. My night balance is particularly bad and often when running in the dark, I felt somewhat stumbly and off balance. 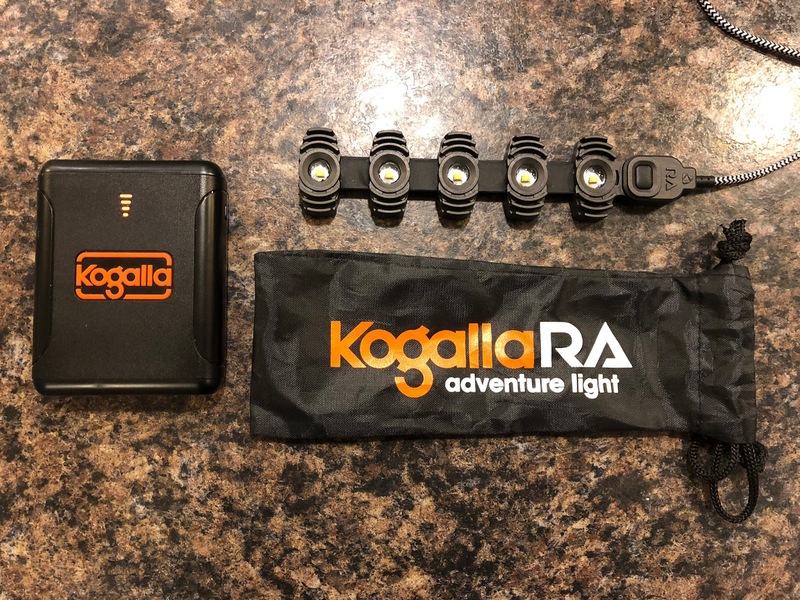 I had never heard of Kogalla and was somewhat unsure of the completely unique look and design, but I was hooked by the 800 lumens and rechargeable battery pack and was eager to test. 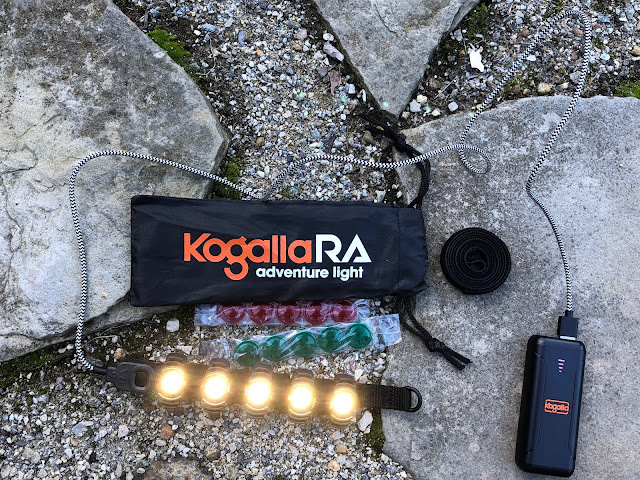 I chose the Kogalla RA with the 13,400 mAh BatPak 2 rated at 6 hours at 800 lumens and 48 hours at 200 lumens, the mid size of the battery options. It includes an accessory kit that with the mounting attachments, a roll of velcro for customized mounting, a storage bag, magnetic plate, as well as green and red snap on lenses. 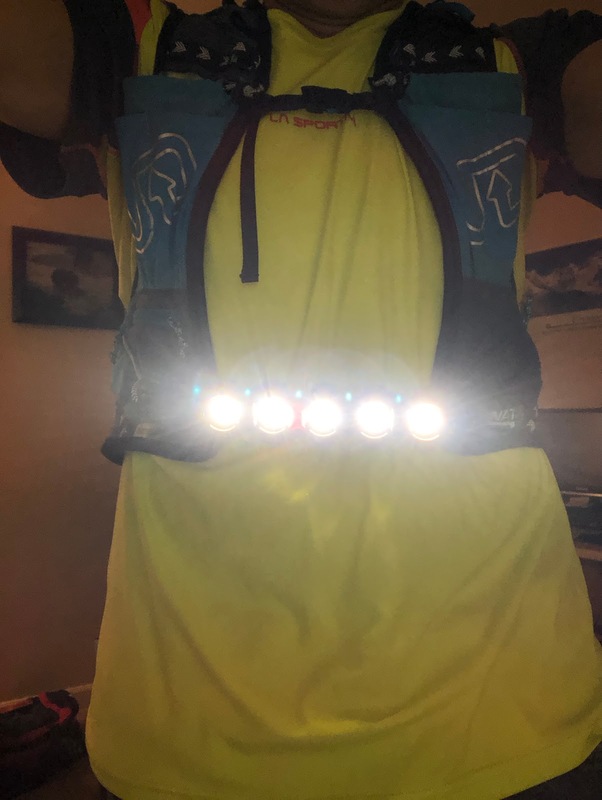 Sam: I chose the Single BatPak 1 Bundle with a 6700 mAh battery rated at 3 hours at a stunning full 800 Lumens and 12 hours at a very respectable 200 lumens. 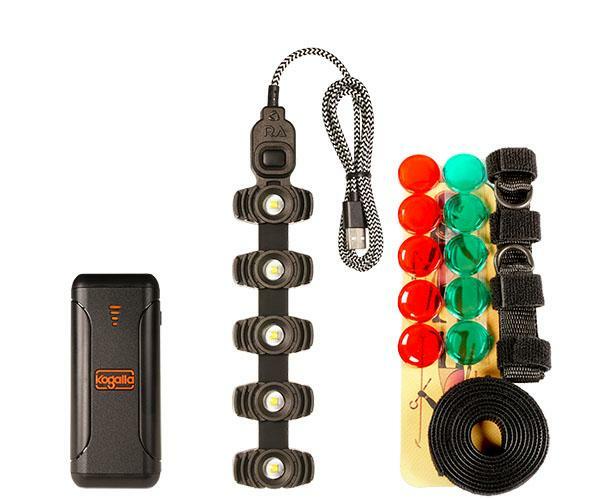 The kit included the BatPak1, 5 LED light bar and cord, webbing strap to attach bar to, velcro roll, red and green lenses, and magnetic plate. Mounting the light at first looks complicated, but only takes a minute to figure out and then the near endless mounting possibilities open up, where you can easily attach to run hydration vests, waist belts, backpack straps, bike handlebars, helmets, or just magnetically attaching to any piece of clothing. When mounting on a hydration vest, it may require a little creativity, but overall is easy to attach and secure on most vests/straps. 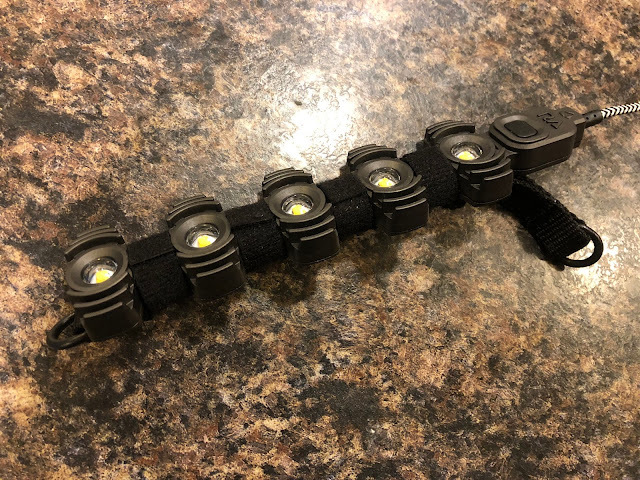 It helps that the light bar is very light and the cord is ~3 feet long, so the battery can be stashed almost anywhere. In addition to the velcro based mounting options, it also comes with a magnetic mounting plate that snaps securely to the 10 magnets on the back side of the light bar. 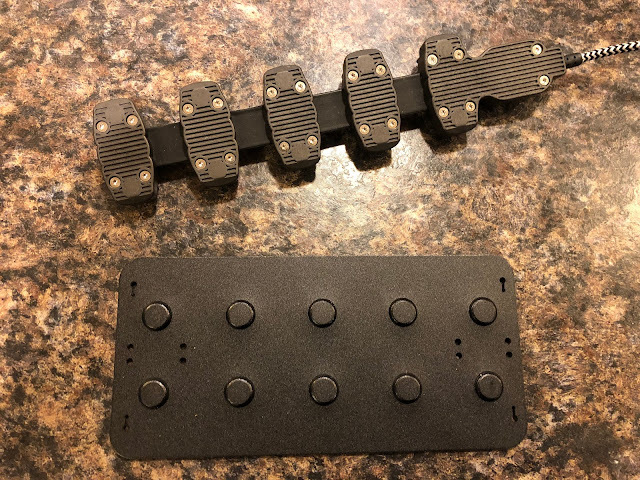 By far my favorite carry method is putting the magnetic plate in one of the pockets of my Naked Running Band. Simply set the light on the outside of the band in line with the magnets on the board and it snaps in place. Both the band and light are very secure, with no bounce at waist level. 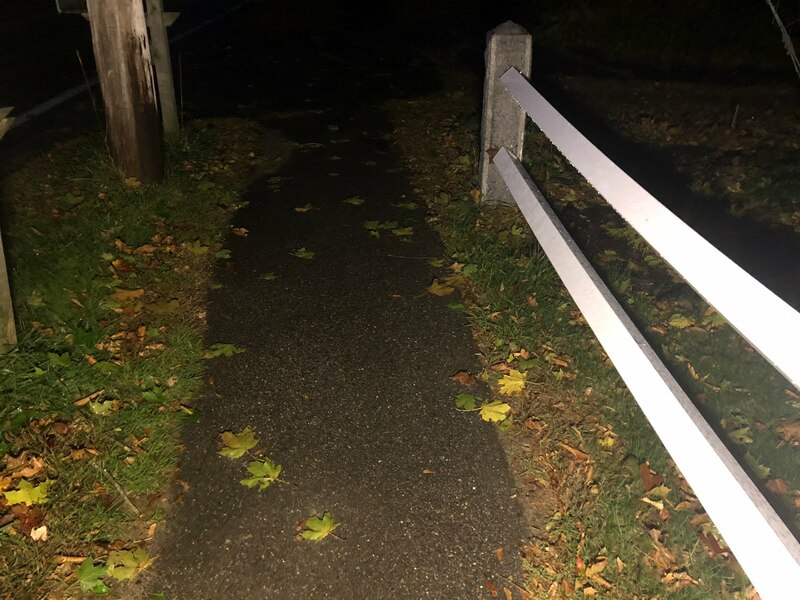 Sam: I primarily run roads at night here in NH. I used two cut strips of the long roll of included industrial grade hook and loop tape to attach the Kogalla to the front of my Amphipod vest. 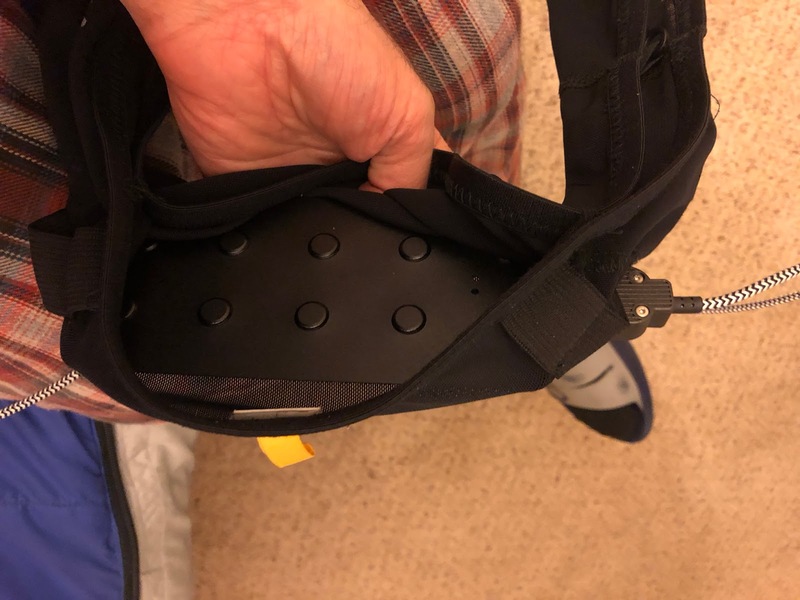 My smaller BatPak 1 goes in the small zip front pocket with cord running behind my neck and under my arm due to its length. If raining, I point the BatPak and cord downwards as the USB connector on the battery is not water rated. In real rough wet conditions I would recommend putting it in a zip lock bag. 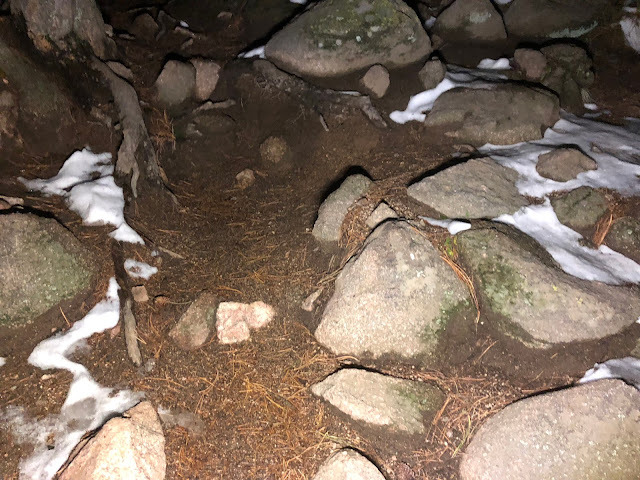 Jeff: I am more than impressed with how the Kogalla RA performs, specifically on the very dark and rocky, technical mountain trails that I frequent at night here in Boulder, Colorado. The Kogalla RA projects a very complete swath of light, wrapping in a 120 degree arc in front of you and projecting impressively far ahead, up and down. The light is not only powerful and vast, but the hue is a warm yellow that very much gives the impression of natural daylight, vs. the more common harsh white lighting found in the majority of lights. This natural warm hue does a remarkable job highlighting the details in the trail, no matter how rough and rugged. With so much light and definition, my night balance is as good as it would be during the day and I have no hesitation. Operation is simple, with a single button that is easy to operate, even with glove liners or thinner gloves. Both Sam and I had some confusion at first with on/off, but there is a specific sequence and timing to the buttons for on/off and dimming, which is really simple (you just have to wait 2 seconds). 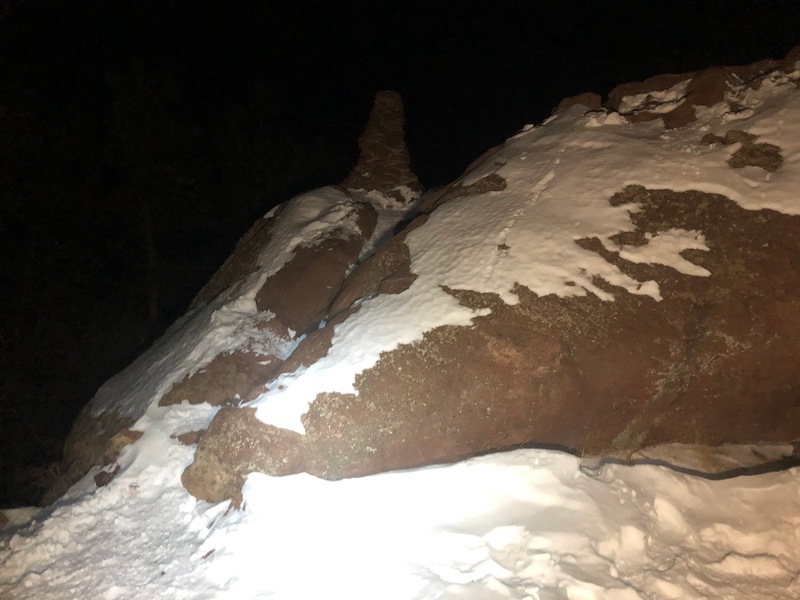 You can adjust the brightness by holding the button and see the light dim or brighten in an incremental fashion, with a quick strobe once you hit the low or high. You turn the BatPak on with a single press and off with a quick double press of its side button. 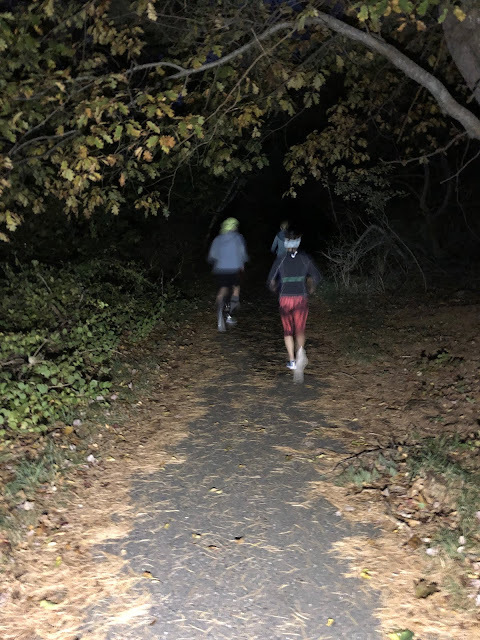 I most often run with two lamps, something on the waist or in the hand, then a headlamp and I still do the same here, as I like a backup and something on my head to always be shining no matter where I look. 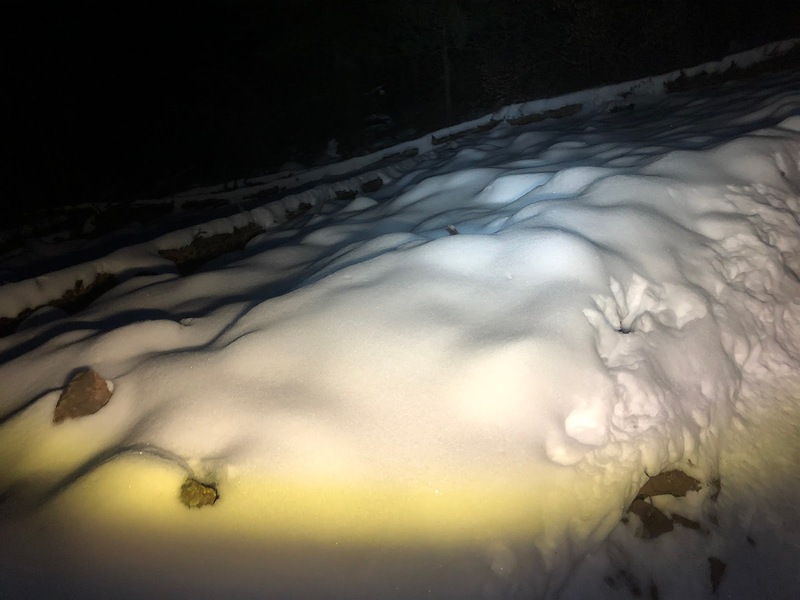 My most powerful headlamps however are nearly imperceptible within the light range of the Kogalla. 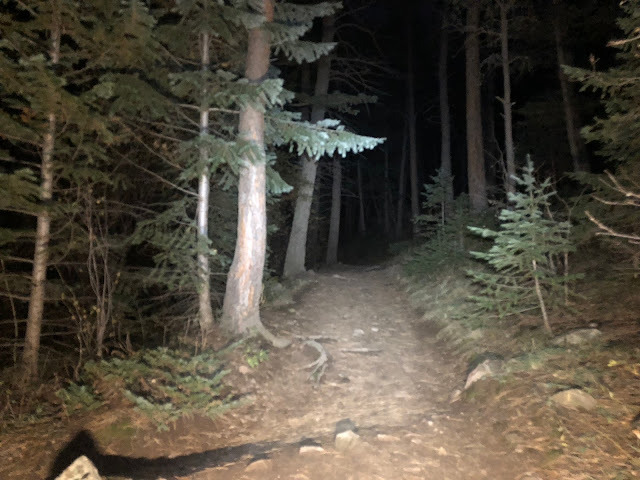 I still like having a headlamp along though for rifling through packs, checking over my shoulder, looking at my watch, or for having a toned down light for when I pass somebody on the trail, as I cover the Kogalla with my arm so as to not blind anyone! "With 800 lumens of warm, natural light dispersed by a precision lens in a 120 degree conical, uniform-luminous-flux pattern, RA lights up an entire area instead of just a spot. 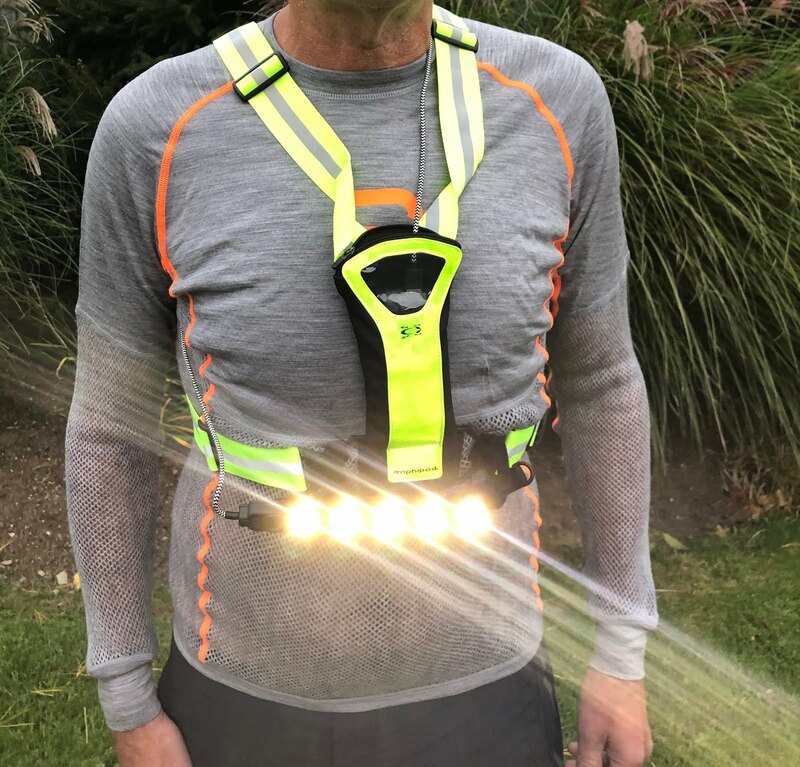 This wide pattern illuminates your peripheral vision and eliminates the need for constant head or hand motion typical with headlamps and flashlights. Uniform luminous flux means that even though you move and bounce, RA doesn't have a hot spot to move and bounce around in front of you. Together, all these carefully thought out features let your neck, eyes and brain relax so you can focus on your activity." Technical trails at night? No problem! The two photos below illustrate the warmth of the light cast off of the snow. 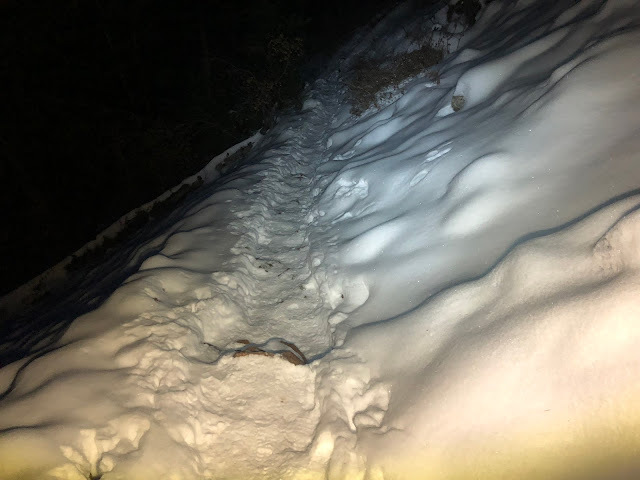 Projecting far and wide on open trails, flushing out all the big kittys. The Kogolla has a warm, natural light. None of that harsh white light of most LED lamps which I find reflects and can obscure detail. Given the five LED and my waist level mount there is no bouncing just a broad view of what is ahead and with exceptional visual clarity and coverage. The beam is shorter than some of the more spot or "tactical" oriented lamps I have used which often must be tilted down to see and can miss the area right ahead of the feet. 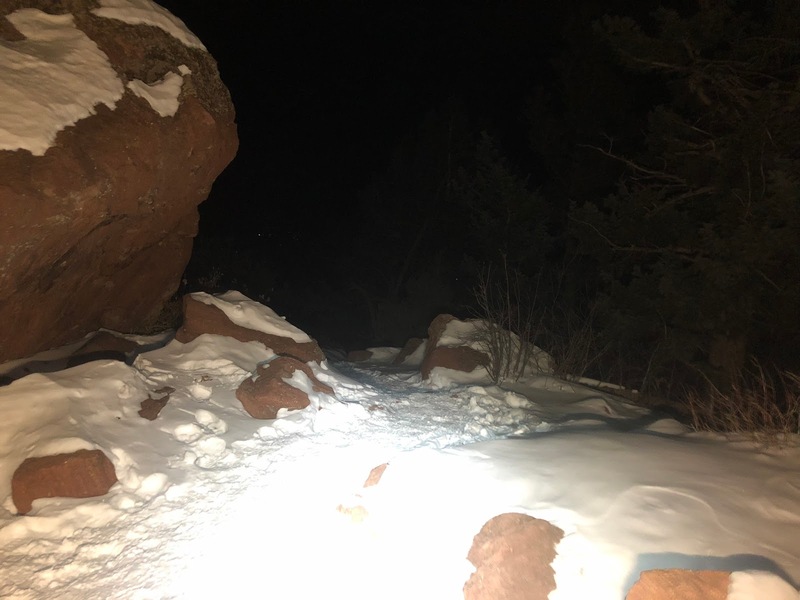 Here warm light and a detailed view everywhere in the near frame but maybe a bit less out far so Jeff suggestion of combining with a more spot oriented light for fast trail use or mountain biking is a good one. I did find it difficult to illuminate my watch or anything that wasn't in the path of travel with the waist mounting of the Kagolla. 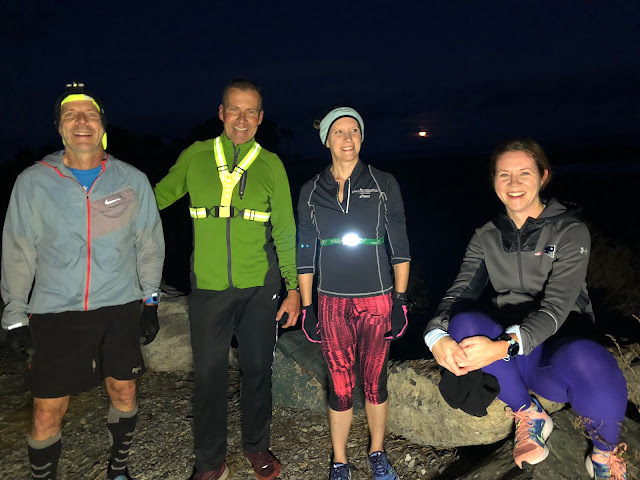 I took my Kogalla out for our Chowder and Beer Gang Wednesday night run along the seacoast of New Hampshire. The other runners with their puny headlamps asked me to run behind them and light the way! 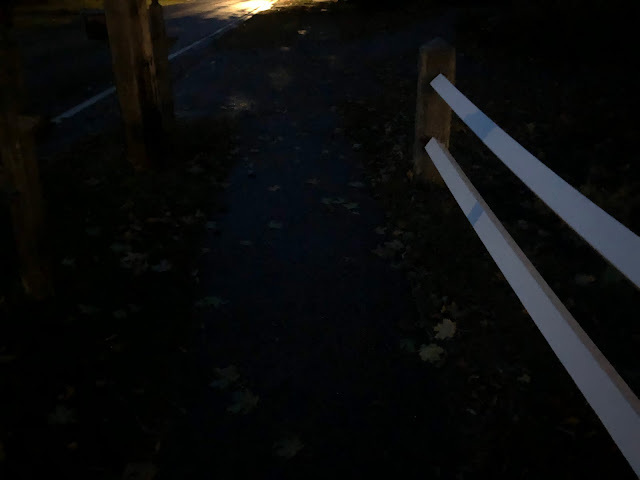 On another late afternoon run with sun falling rapidly a woman backing out of her driveway saw my light, waited and complimented me on the illumination. Cars notice and move out way ahead of what I normally experience with a headlamp. 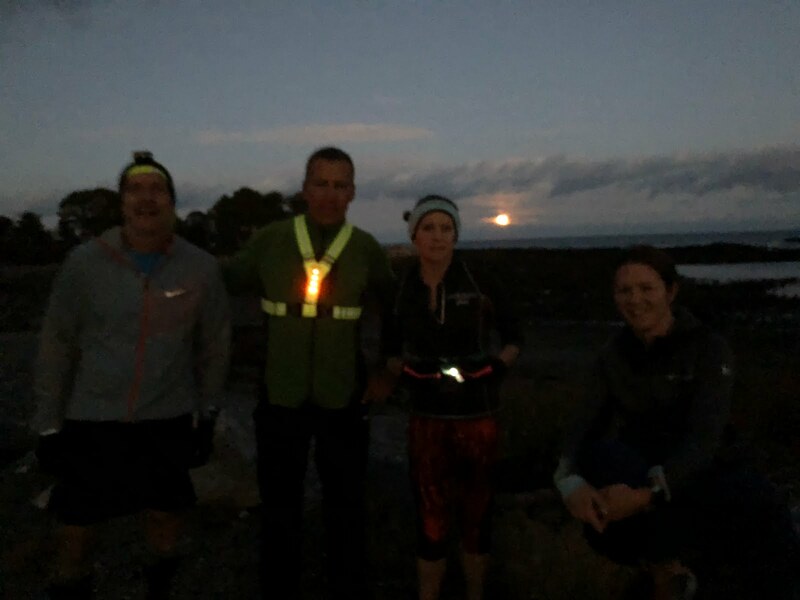 I took a picture of the gang with Kogalla and without during our full moon run. The BatPak1 has 6,700 mAh with the BatPak 3 20,100 mAh. 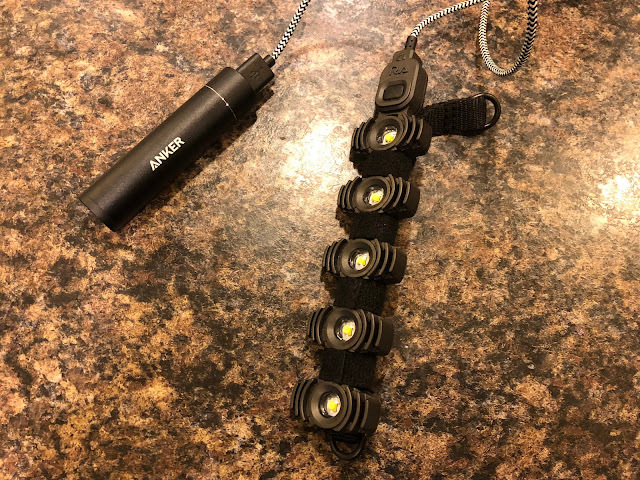 The BatPak 2 in testing lasted me 7 hours and 22 minutes at full 800 lumen power and features 3 USB ports where you can add for a total of 3 light bars and 2,400 total lumens (though that would cut into your battery life). Charging is also via USB cable/charger (not included), but most people now have multiples laying around the house. Charge time from empty to completely full is long, at over 8 hours, so plan ahead! At 251 grams, the BatPak II feels a bit heavy and dense depending upon where you stash it. In a backpack, it goes unnoticed, but in a feathery run vest or run belt, it can be a bit much. The cord is flexible and durable. There is also a battery level indicator light, helpful for predicting how much charge you have left. Jeff: You can use any sufficient USB charging battery pack with Kogalla. 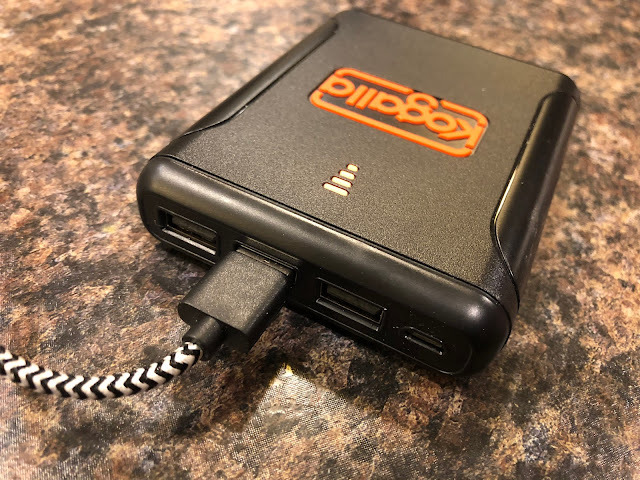 Since the majority of my runs are less than 2 hours, I use a much smaller and lighter battery pack that I often carry for any emergency phone charging or whatever, which easily suffices, lasting for nearly 3 hours. Given the density and weight of the larger batteries, I prefer a few smaller batteries to spread out the weight, as it is easy enough to swap over. If running an ultra event overnight, it would be logical to put freshly charged smaller replacement battery packs in a drop bag. Sam: A brilliant and brilliantly executed new take on the run, adventure, or task illumination. Superb warm natural lighting, and lots of it at 800 lumens, along with many attachment options combine with standard USB charger batteries which can be used for the lamp or other gadgets and phones with new battery Paks swapped in as needed. A superb way to light your way at night. Highly recommended! That's a great review. Very thorough and detailed. The pics really help. 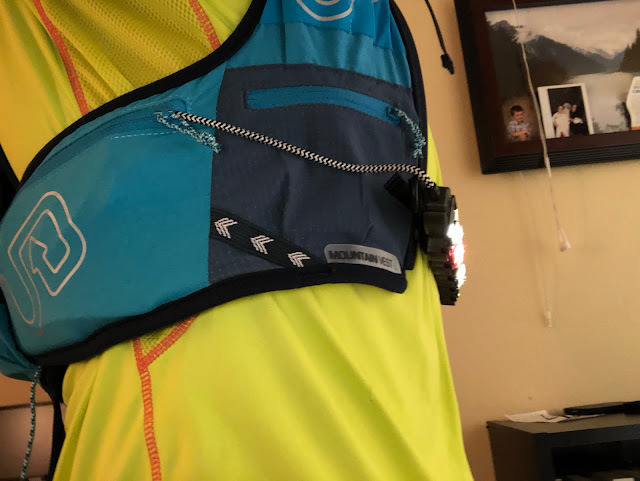 I like the way you mounted it on your running vests and belts. 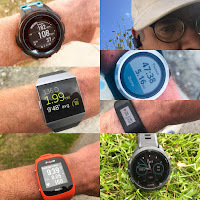 i like your reviews and have a question about the new balance 880 and new balance 1400v6. if im a size 10 in the 880, will the 1400v6 in a size 10 also fit me, are 1400v6 the same in width as the 880, my feet are wide and the 880 in a size 10 fit me. thank you. I have never run the regular upper 880 but have the GTX which I found quite snug due to the bootie. I believe the 1400v6 is on a more performance oriented last than 880 so will he narrower. This said the upper is quite foot friendly for such a race oriented shoe. So can answer your size question definitevly. 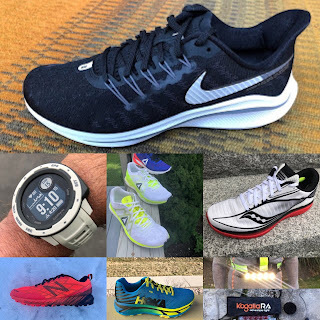 Best to try them in a store or order 2 sizes from Running Warehouse US or EU at any of their links on our pages and free return either or both if they don't fit you. If you shop at Running Warehouse and use our code RTR10 you will get 10% off the 1400.